Andrew 'Woody' Wood, is a professional musician based in Nottingham, UK. Working across a range of genres, Andrew has established himself as one of the most in-demand drummers in the East Midlands both on stage and in the studio. 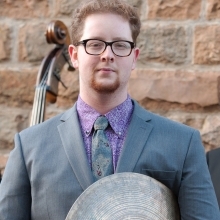 Born in 1991, and having played the drum kit from the age of 13, Andrew is now an experienced performer having had the pleasure of working with jazz groups of every size, orchestras, musical theatre pit bands, wind bands, brass bands and soul bands. In 2010 Andrew was awarded the Trinity Guildhall Open Jazz Award at the National Festival of Music for Youth after a trio performance at the Adrian Boult Hall in Birmingham. Following this success Andrew gained a place at Leeds College of Music, where he studied with mentors including Peter Fairclough (drums), Ronnie Bottomley (drums), Dave Walsh (drums), Jamil Sheriff (Composition), Jamie Taylor (Jazz Harmony), Matthew Warnock (Music Business) and Dave Kane (Improvisation). Since graduating from LCoM in 2013, Andrew has enjoyed a successful freelance career which has seen him perform in the UK, Spain, Andorra, Germany and Poland at venues ranging from intimate jazz clubs to the Royal Albert Hall. Andrew's current focus is directed towards his own projects including a celebration of the music of George Gershwin with the Andrew Wood Trio. He is also a member of the Ben Martin Quartet and deidcated to developing the Nottingham roots jazz scene with the Nottingham Jazz Jam Session and other regional projects. .
Outside of jazz, Andrew is involved with session recording and touring as a freelance musician with other artists such as Harleighblu and Scorzayzee. As an educator, Andrew teaches privately from his home studio in Nottingham, the Ockbrook School in Derby and at the University of Nottingham as part of the BA Music course.